VE: Why is there a giant chicken over there dancing? Aren't we in the suburbs still? VE: Do dancing chickens make people spontaneously desire to get a haircut? VE: Seriously...what kid have you EVER known that volunteered to suddenly get a haircut? Wifey-Poo: It's actually for the parents of the kids. The kids will like the dancing chicken and want to see him. Ooh, fried chicken and biscuits sound really good or should I say waffles, well you know since I live in the south. I mean have you noticed that people in CA have been starting to say which part of the state they live in. And the funny thing is that in the southern part we are slow and easy going while the northern part is always in a hurry and rushing around. Must be because of the hot weather down here. We spent most of January in the 80's. What the heck happened to winter? Anyway wifey-poo is so damn patient with you. But I have to side with you on this one. Chicken, haircut, chicken, haircut, it boggles one's mind to put the two together. Meantime chicken, biscuits, oh yeah. Wait I mean chicken, waffles...oh I am losing my mind. 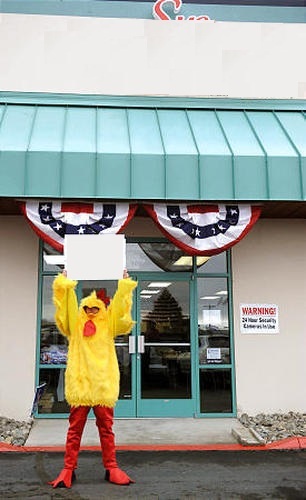 I once saw a dancing chicken advertising a restaurant that served chicken. Weird. I'm with you, man. That chicken thing is just stupid. They could've at least had Edward Scissorhands. Uh, that would probably scare the kids, but whatever. Hum.....just think of the poor sod wearing that thing for hours on end. mrsupole - I'm all for chicken and biscuits too! it"s a little scary. the roles might have been reversed in my car.